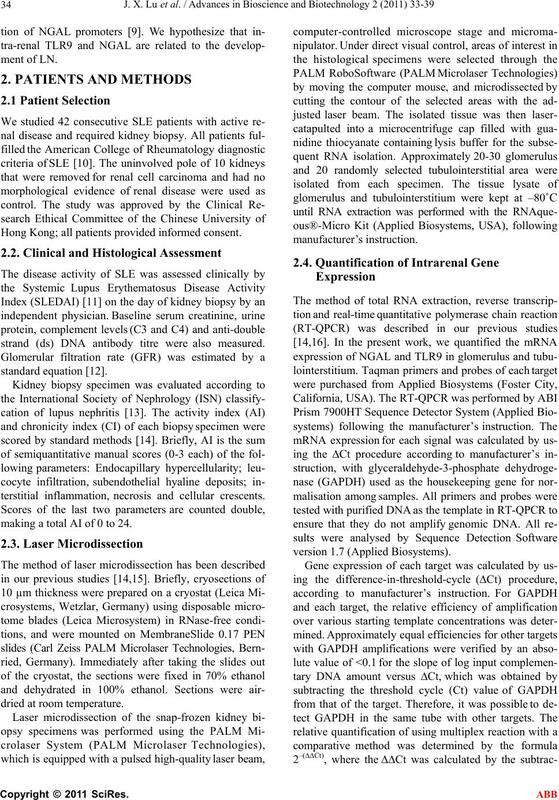 doi:10.4236/abb.2011.21006 Published Online February 2011 (http://www.SciRP.org/journal/abb/). 4Division of Nephrology, Renmin Hospital of Wuhan University, Wuhan, China. 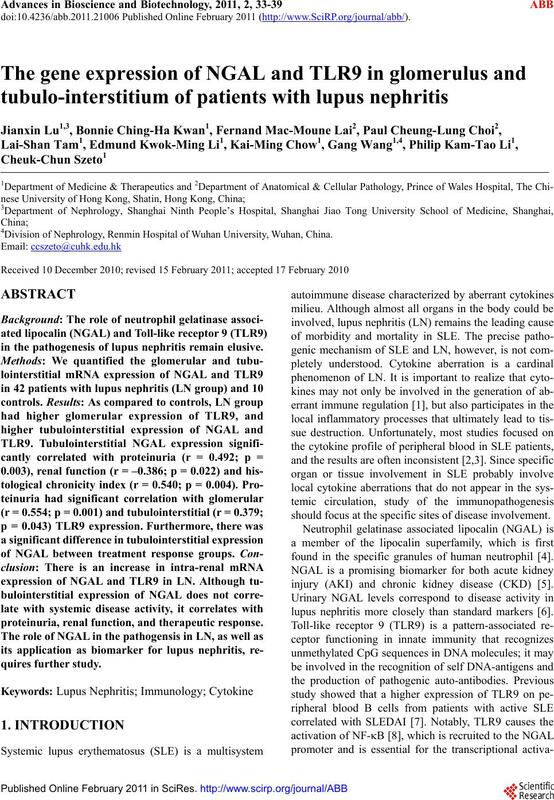 in the pathogenesis of lupus nephritis remain elusive. proteinuria, renal function, and therapeutic response. should focus at the specific sites of disease involvement. found in the specific granules of human neutrophil . injury (AKI) and chronic kidney disease (CKD) . 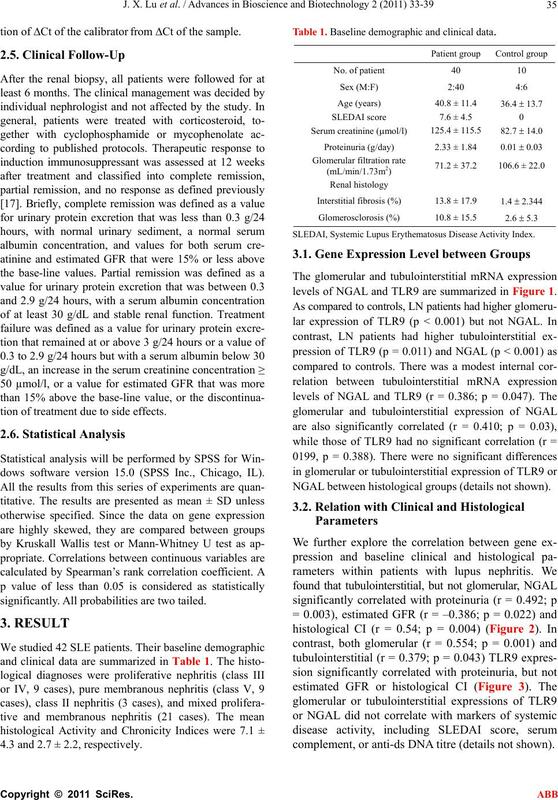 lupus nephritis more closely than standard markers . Hong Kong; all patients provided informed consent. strand (ds) DNA antibody titre were also measured. terstitial inflammation, necrosis and cellular crescents. making a total AI of 0 to 24.
tion of Ct of the calibrator from Ct of the sample. tion of treatment due to side effects. dows software version 15.0 (SPSS Inc., Chicago, IL). significantly. All probabilities are two tailed. 4.3 and 2.7 ± 2.2, respectively. Table 1. Baseline demographic and clinical data. SLEDAI, Systemic Lupus Erythematosus Disease Activity Index. 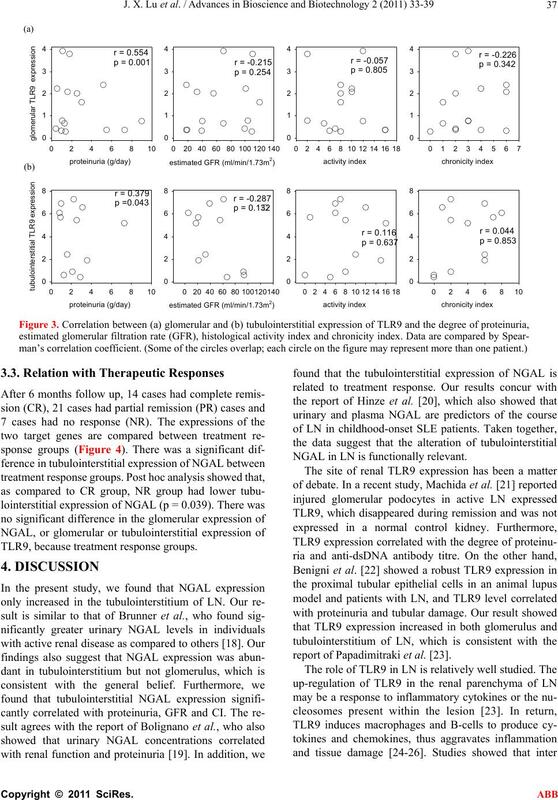 levels of NGAL and TLR9 are summarized in Figure 1. NGAL between histological groups (details not shown). complement, or anti-ds DNA titre (details not shown). TLR9, because treatment response groups. NGAL in LN is functionally relevant. report of Papadimitraki et al. .
erned by factors other than TLR9. to solve these limitations and confirm our findings. part, except in abstract format. 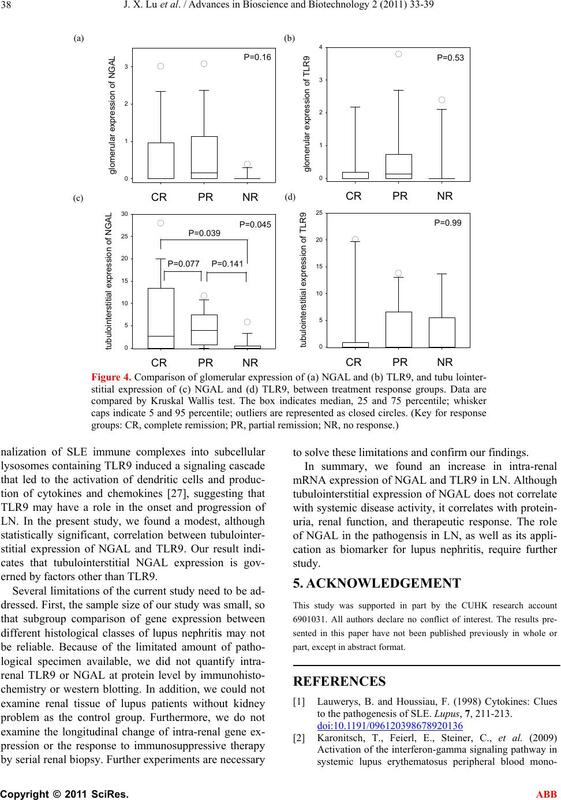 to the pathogenesis of SLE. Lupus, 7, 211-213.
nuclear cells. Arthritis Rheum, 60, 1463-1471.
related gene expressions in systemic lupus erythematosus. Arthritis Res Ther, 11, 1.
lipocalin (NGAL): A new marker of kidney disease. chemical Journa l, 405, 605-615.
systemic lupus erythematosus. Arthritis Rheum, 40, 1725. SLE. Arthritis Rheum, 35, 630-640.
from serum creatinine: A new prediction equation. of Internal Medicine, 130, 461-470.
erythematosus. Arthritis Rheum, 54, 2577-2584.
patients. 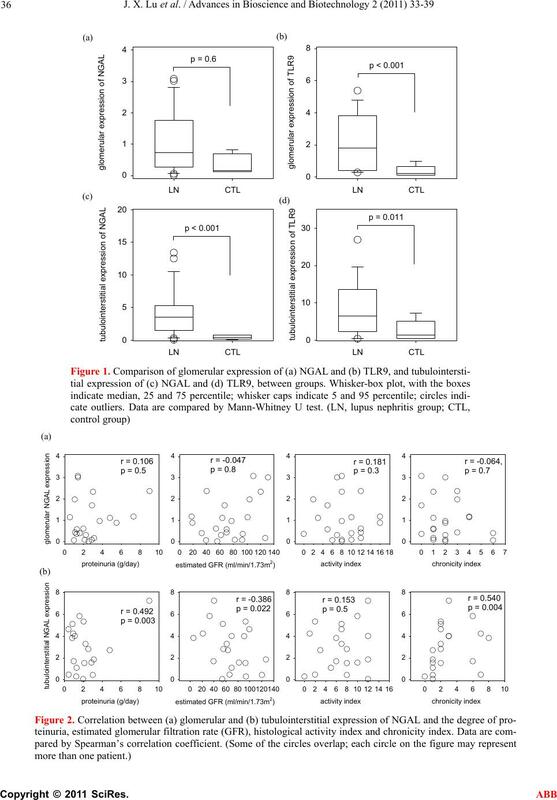 Nephrol Dial Transplant, 23, 414-416.
development of tubulointerstitial injury in systemic lupus. nephritis: the central role of nucleosomes revealed. 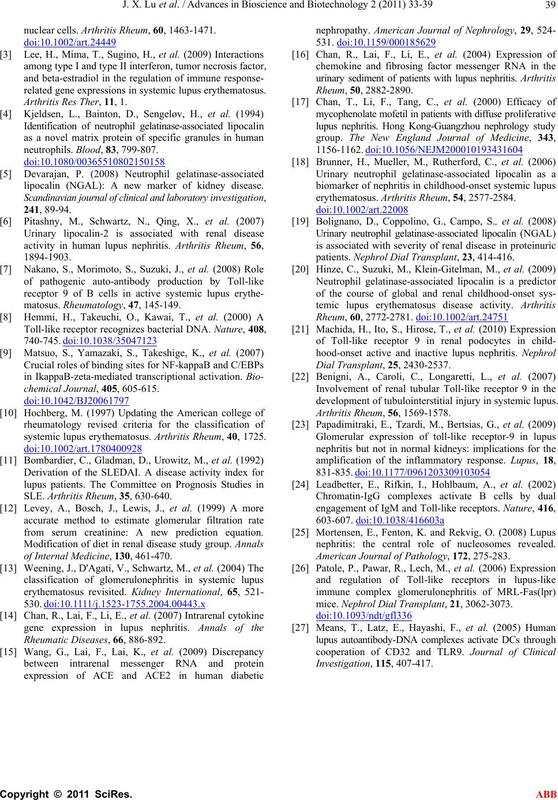 American Journal of Pathology, 172, 275-283.
mice. Nephrol Dial Transplant, 21, 3062-3073.